Needed this many years ago! Been divorced now for 8 hard years and have learned a lot! Plan on getting the book. It’s arduous indeed. I met my now husband in church, we were totally unified in our faith when we married. Long story short, he fell away, we haven’t attended church in 5 years (going solo with the kids for the first time this Sunday! ), but he has also completely distanced himself from me. While I am owning my mistakes and seeking counsel and trying to move toward him, he is distancing, blaming and unforgiving, throwing in the towel. He would never separate, that would be against his own personal code of conduct. I am really struggling moving forward. My sin has no hold over me, I know where my salvation lies. So I press on, toward Jesus, toward my husband, while he is reviving the sins I have repented of, blaming for the distance it has caused taking no ownership of his own offenses. I am at a loss for how to move forward, is a healthy marriage even a realistic goal? Guarding my heart from taking the weight of responsibility that was never mine is exhausting. This is really tough life circumstances, but I would suggest the more common is perhaps just as challenging, if not more so. Being married to a spouse who is a regular church attender, a “good” person, but, in the words of Kyle Idleman, is a fan, not a follower, of Christ – all while claiming to be the later. They affirm they believe the right stuff, etc. etc. but aren’t one with Christ and don’t own the duplicity, nor see a problem with it. In essence, it’s the post modern influence, and lack of real connection with God and Holy Spirit lead knowledge/application of His word. That has been my struggle for more than two decades, and it’s really rough – on so many levels. At least with the unbelieving spouse you know where they are and why. That’s my world – and I wish it for no one else. As Catherine learned, one can only aim to listen to God and respond and grow in the ways He calls you to christian maturity, and not get too overburdened with the many ways you are not able to genuinely connect with your spouse. And, like she said, it is critical that we know that some needs are God sized alone, regardless of who we are married to – so no human should be asked or expected to meet those needs. I agree. How do you witness to someone who already claims to be a believer? This was my situation–I married my husband not thinking he was a believer (being a Christian shouldn’t be a secret, right? 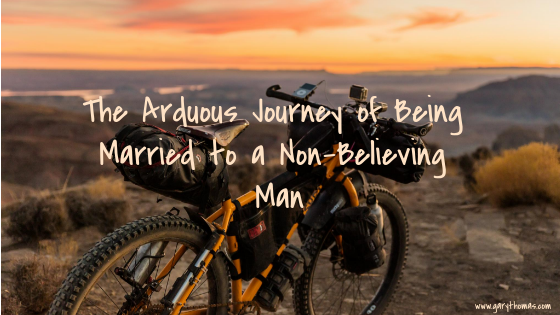 ), and then when I found out he’d accepted Christ when he was in college, I knew I should be happy, but instead I thought, “oh shoot–if this is him as a believer, he’s really missing out.” And other people don’t know how to witness to him. In his mind, he said the prayer and he’s done, and he leads a “good” life and is a kind person, so no need to go any further. And they shall be one flesh. Unity is the key. As I became sanctified by my closeness to my savior and praise and honor him. I must do they same with my husband. Love your God and your neighbor. My husband is not my neighbor but my close partner and part of me so I must give him that love regardless of his faith or not( that’s Gods job who changes the heart) that love that God gives me daily. Is a hard task to die yourself everyday and share that love starting at home and into the world. It’s something I learn everyday. An as a newly born again believer I have the faith and hope that Jesus will touch my husband heart today, because today is the day of salvation! Sometimes a husband continues to claim to be a believer, even goes to church with you, but then lives a life outside of the commandments of Christ. And for far more than twenty years. That is not the wife doing anything wrong, either. And it’s much harder. Thank you for sharing this, it still give some encouragement. I’m one of those women described at the beginning–I married a non-Christian, believing that God would change his heart. It’s been a hard 26 years, and though I can see a lot of work God’s done on me and my maturing as a Christian, there is no evidence of change in my husband’s life (yes, I realize God is still working behind the scenes, but it’s still hard). We have a pretty good marriage as far as getting along, not disagreeing much, etc, but there’s also a lack of spiritual and emotional intimacy. My fear with this article is that if a single Christian woman is involved w/a non-believer, this story may give her enough hope to continue in the relationship w/the belief that God will simply fix things in time–and they don’t realize how very long that time may be, or that it may not happen at all. I understand how hard times bring us closer to God, and for that I’m thankful–but I am well aware that I’m missing out on experiencing a marriage closer to the one that God designed. It is almost as if I am reading my story. My early prayers in our marriage were asking God to let me leave and His answer was an emphatic NO! So I changed my prayers to do His will and He has worked wonders. While my husband doesn’t yet believe (been married 17 years now) he is very supportive of christian schooling for our children and he has become a recognizable member of our church community through scouts and attending services with us. I know one day he will be with us in our faith and belief for God has put it in my heart, it’s just, as in Catherine’s story, a journey we will take together to grow us closer in Christ and all in His time. 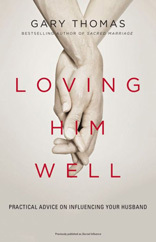 I received my copy of Loving him Well just yesterday and am so excited to start reading. Thank you Gary for all you do. As an author of several Christian books, a former pastor and teacher, and a grandson from a “mixed” marriage, I understand where you’re coming from. My maternal grandparents–both now with the Lord– were married more than 40 years before Grandpa surrendered to Jesus. Grandma’s mother was widowed when Grandma was a child, and her mom married an ungodly man. But they attended a liberal church, where Grandma found Jesus via the testimony of her believing SS teacher. So with little sound Christian example, Grandma married my grandfather, a “good” man–a hard worker, respected in the community–and he loved his two daughters, the oldest of whom became my mother. Along the way, Grandma and her girls (my mother and aunt) got involved in a gospel-preaching church. The man who gave them a ride to church each Sunday was a young farmer, a solid Christian–eventually he became my dad. Grandma was patient and loving with Grandpa. They went places together, and did things together, except that Grandma refused to attend the local dance hall, where Grandpa was the bouncer until I was a teen. Grandpa’s forays into church were only when his grandkids were involved in a church program. As a young man in Bible school I once witnessed to him, using John chapter 3. He repented before he died, and asked Grandma to thank me for my witness (I was away at college at the time). They are now the ancestors of five generators, many of whom are actively serving the Lord. Was it worth it for Grandma to stay with him? Her rewards, both in this life and in eternity say YES! I loved this article! I am in the same position as Catherine. This was very encouraging to me and gives me hope that my husband some day will decide to give his life to Jesus.